NICVA has published the latest State of the Sector research in a brand new online resource which you can explore here. This new online format enables users to easily navigate across the different sections and download the data behind the research. It will also enable the Research Team at NICVA to update State of the Sector on a rolling basis, which means the information available to users will be more up-to-date than in previous formats. The research estimates that there are 6,127 voluntary, community and social enterprise organisations that currently operate in Northern Ireland (this figure excludes branches). The council areas with the highest concentration of organisations include Belfast (26.89%), Armagh, Banbridge and Craigavon (10.9%) and Derry and Strabane (9.18%). Notably Belfast South is the constituency with the highest proportion of organisations (10.62%). In the State of the Sector survey 70% of respondents identified their organisation as voluntary while 25% identified their organisation as a community group. 5% of organisations identified themselves as a social enterprise. A high proportion of respondents (81%) were based in Northern Ireland only, while 6.7% were part of a UK wide organisation and 5.8% were part of an all-Ireland organisation. The top five areas of work identified by respondents were community development, education and training, health and wellbeing, children (6-13 years) and children (0-5 years). The top 20 areas of work identified by State of the Sector respondents are listed below. 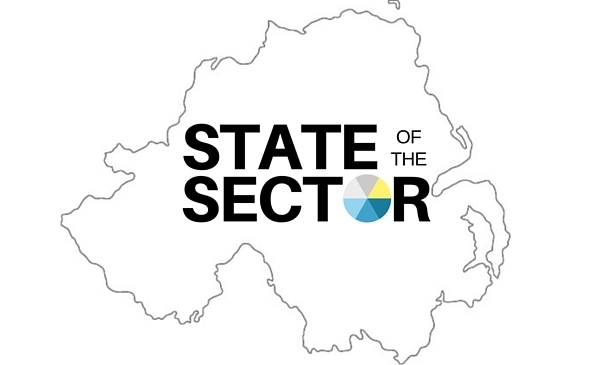 State of the Sector brings together data from numerous sources, including NICVA’s State of the Sector, the Sector Forecast and Workforce Surveys. Data is also drawn from the Millward Brown Omnibus Survey, NICVA’s administrative database, the Government Funders Database, 360 Giving and open datasets. Data was also sought directly from Grant Making Trusts, Government Departments, Non Departmental Public Bodies and Councils. You can read more about the methodology behind the research here.